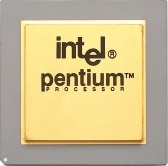 The Pentium P5 processor was introduced in 1993. It used a 5 Volt power supply and had 3.1 million transistors. 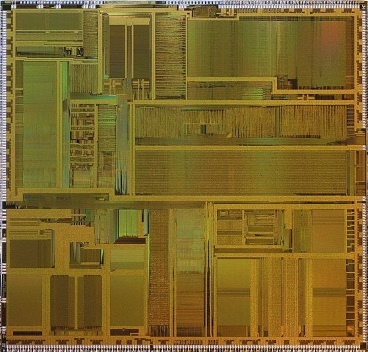 Fabricated in 0.8-micron bipolar complementary metal oxide semiconductor (BiCMOS) technology, its die measured 16.7 mm by 17.6 mm. It had a 2x8 kb L1 cache, and operated at 50, 60 and 66 MHz. The Pentium P5 was the first superscalar processor. It has two integer (U and V) pipelines that allow it to complete two instructions per clock cycle. The pipelines had five stages and were served by two 32-byte prefetch buffers. P5 pipelined floating-point unit had 8 stages. A bug that was discovered in its floating point unit soon after it was released. It was a minor bug, but was blown way out of proportion because Intel didn't recognize and correct it immediately. The Pentium’s branch prediction use a Branch Target Buffer (BTB) to speed up program execution by anticipating branches and ensuring that branched-to code was available in cache. A 64-bit external data bus gives the Pentium P5 4GB of memory addressing capability, but, it has only 32-bit internal registers. Internally instructions are broken down into 32-bit instructions and data elements. The Pentium processor has an on-chip Advanced Programmable Interrupt Controller (APIC). This APIC implementation supports multiprocessor interrupt management, inter-processor interrupt support and multiple I/O subsystem support. Even-parity checking is implemented for the data bus and the internal caches and buffers.